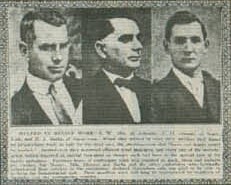 C. O. Dimond, Sr. (Center) was featured in a newspaper article for his help in relief work after a local disaaster. SOUTH FORK, PA -- Charles O. Dimond Funeral Home, Inc., 621 Maple Street in South Fork, is celebrating 100 years of service this year. The funeral home has been owned and operated by three generations: Charles O. Dimond Sr., Charles O. Dimond Jr., and Charles O. Dimond, III. Charles O. Dimond Sr. was born in Summerhill, PA, April 28, 1881, son of Charles A. and Melinda (Cullen) Dimond. He received his early education in the Summerhill Schools and graduated from the Pittsburgh College of Embalming in 1899. He operated a funeral business in Summerhill for a short time before establishing a business in South Fork in 1900. At that time, he was the youngest licensed undertaker in the country. Mr. Dimond, better known as "Charlie" operated a meat market in South Fork for the M. C. Dimond Estate along with his undertaker establishment. Mr. Dimond married Laura Mae Wicks, daughter of Mr. & Mrs. Joseph A. Wicks, of South Fork, in 1903. They purchased the property next to the meat market, in the business district, for their business and residence. The family was awakened at 2 a.m. February 12, 1909 when a fire had broken out in the meat market. The fire destroyed their home and they also lost their wagons, and other funeral equipment and supplies. 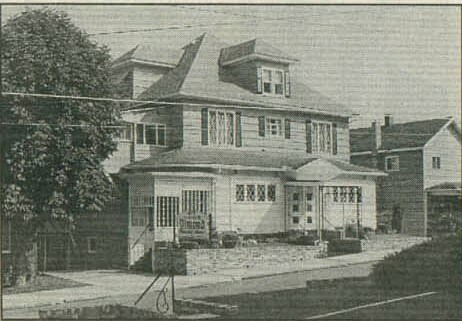 Diamond Funeral Home in the 1950s. Diamond Funeral Home in the 1960s. 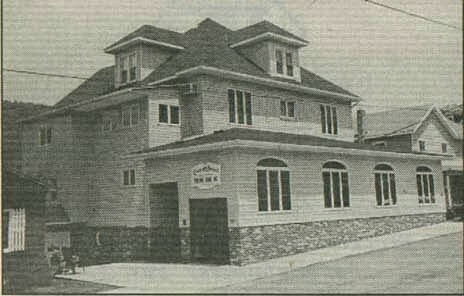 Start of Dimond Funeral Home on lower end of Main Street, 1900-1909. 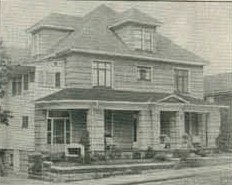 Dimond Funeral Home, Grant Street, 1910-1945. This building was purchased for both a family residence and a funeral home. A casket display room and small chapel for viewing were later added. In July 1914 this funeral for two boys killed while playing under Pennsylvania Railroad cars in Sunshine was the first double funeral in South Fork. 1946. Dimond Funeral Home on Maple Street. 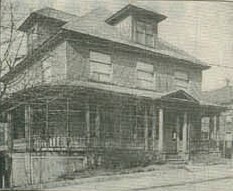 In 1946, the large family home on Maple Street was purchased. Over the next fifty years, extensive renovations were made to accommodate the custom of viewing the deceased and receiving friends at the funeral home, rather than at a private residence. To accommodate the increased use of cars, parking lots were added. 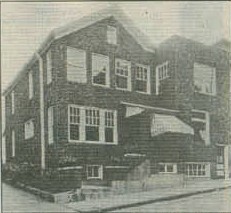 Mr. Dimond then purchased a property at 309 Grant Street. He had remodeled the building and added an addition to make it suitable as both a dwelling and a business establishment. 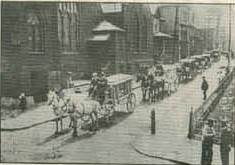 Along with the extensive remodeling, wagons (hearses and lead wagons) all had to be replaced. The team of horses and wagons were replaced by the modern "horseless carriage" around 1920. In 1931 another additon was added to the back of the property making room for a larger casket display room and chapel that could be used for viewing the deceased, even though at this time it was still much more common to haave the deceased viewed in their own home. A son, Donald C., graduated from Eckles Embalming School in Philadelphia in 1934, and finished his internship with his father. Charles O. Dimond Sr., and his wife, purchased a property in Windber in the late 1930's and established a funeral home with Donald as the supervisor. C. O. Dimond Jr., a younger son, graduated from the Cincinnati College of Embalming in Cincinnati, OH, in 1937 and worked for his father in South Fork. When Donald went into the US Army during World War II, C. O. operated the Windber funeral home as well as working with his father. When Donald returned after the war, C. O. returned to work at the South Fork location with his father. 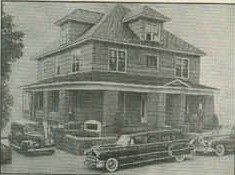 In 1944, Mr. & Mrs. C. O. Dimond Sr. purchased a property at 621 Maple Street in South Fork, which has been the present location of the funeral home since 1946. Mr. Dimond died after an extended illness at his home Oct. 16, 1944. The funeral home continued under the supervision of C. O. Dimond Jr. and his mother, Mrs. Dimond, Sr., for many years. Mr. Dimond was very active and well known throughout the area. He served on Borough Council in 1918 and again in 1934 until the time of his death. He was actively involved for many years with the Boy Scouts and Red Cross. Mr. Dimond was a chartered member of the South Fork Fraternal Order of the Eagles and took and [sic] active part in the advancement of the South Fork Volunteer Fire Co. of which he was made a lifetime member. He was president of the Central Pennsylvania Funeral Directors from 1931 to 1936 and in 1940. Mr. Dimond also operated an invalid coach service (later known as an ambulance service). The ambulance service ended September 1, 1975. He served at 3 major mine explosions, the last explosion being the Sonman Mine Disaster in 1940. He also was involved with the Southern Cambria Street Car wreck of 1916. During WWII, Mr. Dimond and his son C. O., were active in the local Civilian Defense Corp. Staff. Dimond Funeral Home in the 1970s and 1980s. Dimond Funeral Home as it has appeared since 1992. Mrs. Dimond Sr. was also active in various organizations and in holding office in the South Fork PTA, South Fork Branch of YWCA, Amer. Legion in SF., the county, and state. She was a member of the "8 and 40." Mrs. Dimond died at her home, May 28, 1972. Both Mr. and Mrs. Dimond are buried in Grandview Cemetery, Johnstown. "C.O.," followed in his father's footsteps as a funeral director and took an active interest in the community. C. O. served several terms on the borough council until the time of his death. He served as borough council president, President of the Industrial Development Group, Boy Scouting, Lions Club, and many other organizations. He married the former Louise Weston. She became an active part of the business handling all office functions, playing the organ and attendant at the door. She was present at all social gatherings in the area. She was very active in the Cambria County Federation of Women's Clubs, South Fork Library, Mercy Hospital's Women's Guild, and filled in at many local churches as a substitute organist. She was the mother to six children: Mary Lou, Charles III, Barbara, Susie, Kristie, and Jeffrey. A longtime employee and vital part of the organization is Glenn Jackson. He began working at the funeral home following graduation from South Fork High School in 1942. He entered the army and served during World War II. Upon discharge in December of 1945 he returned to work at the funeral home. He was secretary/treasurer for South Fork borough for 35 years. He is a member of Wesley United Methodist Church. The husband of the late Margaret Helsel, he has two sons. He now has 58 years with the firm, working for all three generations of Dimonds. Upon the death of C. O., his son Charles III became supervisor of the funeral home. Along with his mother and brother Jeffrey, the continued the operation of the funeral home. For five years Charles III and Jeffrey worked together in the funeral home. Charles was still active in the South Fork Insurance Exchange at this time. Jeffrey left in 1986 to pursue a career in California. At this time Charles III and his wife Susan ran the funeral home along with Glenn Jackson. Over the years the funeral home has depended on a lot of part time help who were very faithful to the funeral home. Currently Clyde Wadsworth and Matt Waddell, both with over 40 years service, are still working. Martin Slanoe and Ken Thomas are the new additions with Marty having 1 year and Ken 14 years. October 1, 1999, Joe Golden became a full time member of the staff as the resident intern. Joe worked part time during his schooling for 4 years prior to October. He graduated from California University of Pennsylvania and from the Pittsburgh Institute of Mortuary Science. He has passed his National Boards and just recently obtained his live insurance license. Joe will obtain his funeral director license in October after completing his internship. Sue and Chuck Dimond are both graduates of Kent State University, Ohio, and Chuch is also a graduate of the Pittsburgh Institute of Mortuary Science. Chuck is a member of the Pennsylvania and National Funeral Directors Associations. He also possesses his Life Insurance license and is active with Forethought. Susan was a member and president of the former Summerhill Women's Club. The business is celebrating 100 years this year and some of the projects on tap are a web page for the funeral home, general upgrading of the computer system, and sprucing up the appearance of the facility. The Dimond family thanks the members of the community for their years of support and look forwarding [sic] to continuing the firm's tradition in the future. See also: Charles O. Dimond Funeral Home, Inc. for more history.